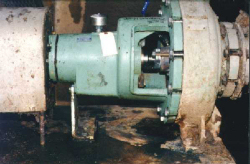 WeeCraft is committed to ongoing service and support of companies and individuals who manage, maintain, repair, or purchase high volume industrial process pumps or other industrial equipment where precision shaft seals are required. 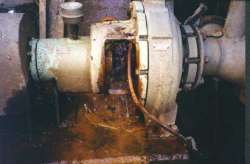 Before: Using conventional packing, lantern ring and flush water, this pump is leaking at the rate of about 3 gallons per minute not counting the consumption of flush water being consumed. After: Using the WeeSeal Cage with an Injectable Sealing Compound, this pump is running leak free without the use of flush water. WeeCraft, Corp. offers quality products that enhance an injectable sealing compound's functionality, providing leak free operation without using flush water. The WeeSeal Cage consists of two primary elements: a pair of plastic rails which act to hold the outboard packing rings in place, and a number of spacer pins which maintain the proper distance between the cage rails. The space between the cage rails that is provided by the spacer pins is filled by injecting a high quality injectable sealing compound. The WeeSeal Cage / injectable sealing compound system has been used successfully in applications where stuffing box temperatures do not exceed 180 degrees F.
The WeeSeal Cage is available in sizes that fit most shaft seal applications. Spacing Pins are available in sizes tailored to fit most packing ring and lantern ring replacement sizes. Master Kits are available for WeeSeal Cages and Pins. These Master Kits contain all of the standard sizes. Custom sizes are available upon request.